Newtok is sinking. Perched on permafrost by the edge of the Bering Sea, the Alaskan indigenous village is losing a battle against a formless enemy that, rather than wage open war, has decided upon a siege-like strategy – raise the temperature degree by slow degree, erode the riverbank inch by precious inch. Village elders have determined that a retreat to higher, more solid ground is the only recourse. Some of the younger villagers want to stay and defend their home, build the seawalls higher, but the elders have won out for now. The plan to relocate marches on. They now just need to figure out the way to get there, which is a more complicated proposition. How, exactly, does one move an entire village across the Alaskan tundra? The answer: enlist the help of a potent fighting force. Bring in the Marines. Two Blackhawk helicopters ascend in a double helix from the tarmac of the Bethel, Alaska Army National Guard hangar and angle due west. I sit in the trailing helicopter, wedged between two Marines that peer out the windows onto the tundra passing below. The pilot maintains an altitude I estimate around 100 feet, low enough for me to spot individual cormorants and egrets startled into flight. The landscape defies any sense of order, with prairie potholes scattered around rivers wending every which way to the Bering Sea; it strikes me this is a terrain that would give the Army Corps of Engineers nightmares. For the first half hour, I search intently for megafauna – musk oxen, moose, brown bears. Finding none, I sit back in my seat and assess my gear. The body armor, ammunition, and rifle of my Iraq deployment are gone, replaced by a fleece jacket, books, and a computer. I lug a medical bag, too. I’ll take care of the Marines over the next eight weeks. The two on either side of me look increasingly anxious for the flight to end. The military first arrived in Mertarvik in 2009 under the auspices of a Department of Defense program known as Innovative Readiness Training (IRT). The program aims to serve communities in the United States while providing training for reservists. IRT missions generally focus on providing medical resources to rural communities with limited access to health care. The Mertarvik mission is different – it aims to move a village. 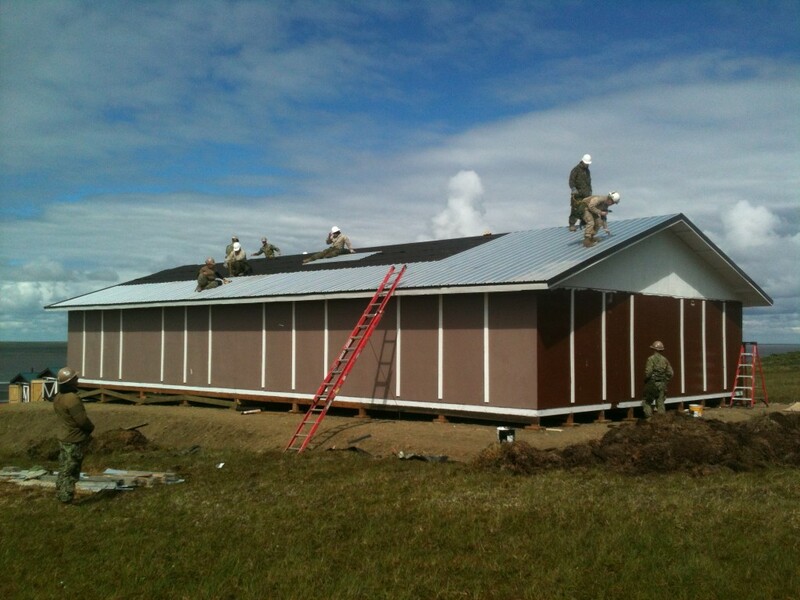 2013 – the year I volunteered – marked the last of four summers in which reservists from the Army, Air Force, Marines and Navy pitched in to help relocate the roughly 400 indigenous Americans of Newtok. Situated on the coast of western Alaska, the village sits atop permafrost that, in recent years, has become less permanently frosted due to rising temperatures attributed to global warming. To complicate matters, the adjacent Ninglick River has taken advantage of the soft soil to erode almost eighty feet per year of its banks; the Army Corps of Engineers estimates the river will reach the current center of town by 2017. Faced with the imminent demise of their home, the villagers of Newtok initially tried to fend off the encroaching river by building a sea wall, but the sea wall sank. Subsequent studies determined the villagers had no choice but to relocate. Through a land swap negotiated with the U.S. Fish and Wildlife Service, Newtok obtained title to a site nine miles upriver, known as Mertarvik. Mertarvik sits on gently sloping tundra and, unlike Newtok, enjoys a base of volcanic rock. When the military landed in Mertarvik for the summer, it joined Moses, the first and only villager to relocate permanently. Moses stands out in Mertarvik. Instead of camouflage Gore-Tex gear, he wears a hooded plaid sweatshirt, sweatpants, and mud boots. Standing less than five feet tall, he strikes a contrast with the muscled-up Marines. He ambles from his house to his boat and from his boat to his house with a rolling gait, perhaps from a limp, or perhaps from the bowed legs developed at sea (even as a medic, I never learn). His route does not vary – this is by necessity. Mertarvik is a one-road town. The lack of infrastructure is surprising given that this is the last summer of the mission. I envisioned a town with sidewalks and plumbing and utility poles in place, a town we, the military, would put the finishing touches on – a door painted here, a roof raised there. But no. Our goals for the next eight weeks are modest. We will build two storage huts to complement an evacuation center and two sheds. The sidewalks, plumbing, and electricity will wait for another year. 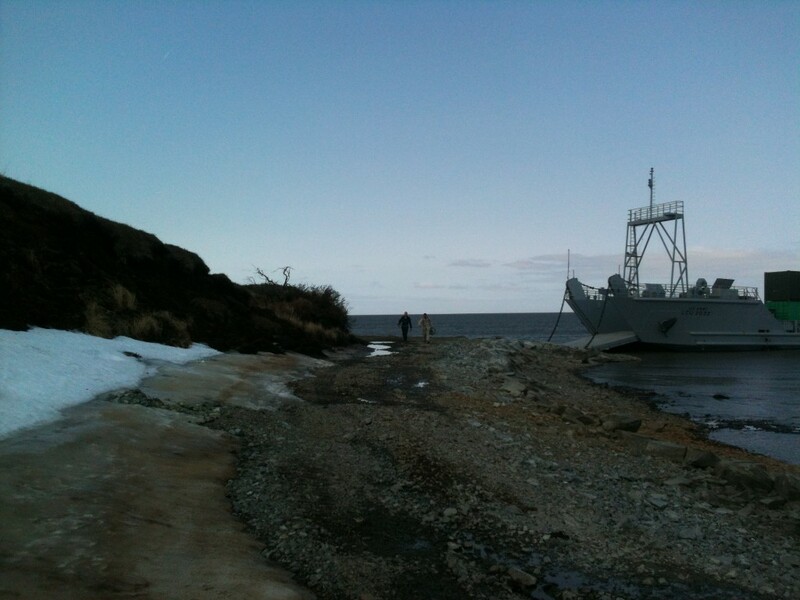 Some mornings en route to his boat, Moses stops to talk with the officer in charge of the mission, Captain Hailey. They discuss the weather, the quality of the fishing season, and the progress of the construction. I estimate Moses’ age to be around 70, making him a good thirty years’ senior to Captain Hailey. 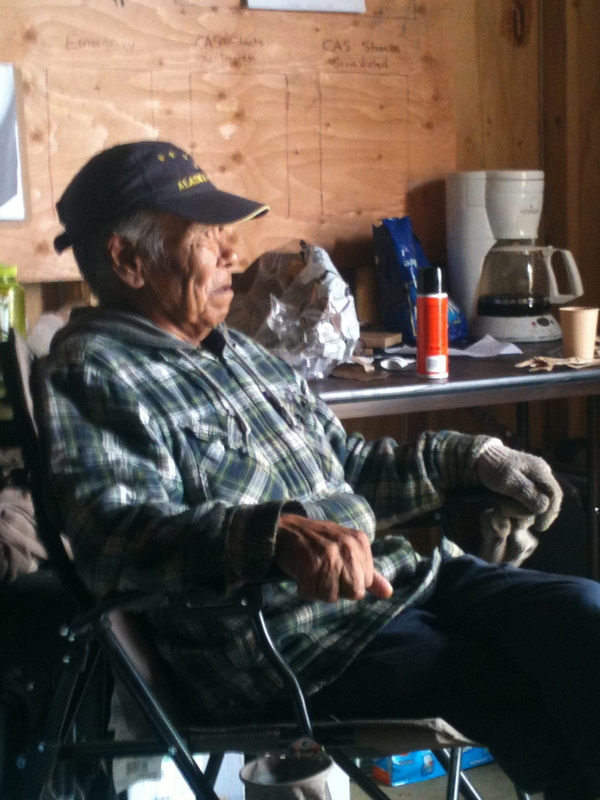 He is our camp elder, then, as well as a Newtok elder. Two weeks pass before I find an opportunity to talk with Moses. I have been busy unpacking gear, setting up the aid station, and treating Marines for what I dub the “Mertarvik malaise” (symptoms: runny nose, mild cough, and a general sense that mother nature walloped you). When not manning the aid station, I stand watch at the construction site as the Marines lay the foundations for the two storage buildings that Navy Seabees will build later in the summer. My role is to render first aid in case a Marine bangs his thumb with a hammer, or rolls an ankle on the spongy tundra. Fortunately for the Marines, no one gets injured, but it makes my job extremely dull and bitterly cold. On one such watch, I take shelter in one of the sheds built the previous summer. It is June in Alaska, but the near-constant wind and rain rolling off the Bering Sea create a climate that is anything but summery. Bundled in multiple layers of thermals, I gaze longingly over to the middle of three houses built by private contractors. Wisps of smoke trail from the stovepipe. Moses emerges and walks in my direction. He squats next to me and observes in silence the bucket loader at work, pushing, dragging, and flattening out the tundra soil. Unprompted, he points off to the south, up the hill from where we currently sit. “Saw three brown bears that way, earlier this spring.” Yup’ik is Moses’ first language, but he also speaks English with a clipped accent. I take his opening as an invitation to ask a few questions, and our conversation proceeds to wander from themes of wildlife (the ptarmigan make for good eating, as do the eggs), to berries (the blackberries are currently ripe for picking up on the ridge), to moving houses from Newtok to Mertarvik this winter (the plan is to load the houses on skids and drag them over the frozen Ninglick River). He survives largely as his ancestors did for centuries before him – subsistence hunting and fishing. Unlike his ancestors, though, he does it largely alone. Moses is a pioneer, the first to adopt Mertarvik as his home. Like many pioneers, he may have been driven out of his community. Rumor has it a bloc of younger villagers, disgruntled by the slow pace of the relocation effort, voted Moses out as head of the Newtok Tribal Council in 2012. I don’t know if this is true or not – I decide not to delve into the local village politics, instead narrowly focusing on my role to provide medical care for the reservists. Nonetheless, I find it easy to sympathize with Moses. He and the council must navigate a daunting maze of state and federal bureaucracies to enlist help. A 2007 Army Corps of Engineers study put the cost of moving the entire village at $130 million; the estimated cost of relocating a single house rises quickly above $200,000. For the villagers of Newtok who live largely below the poverty line and subsist on hunting and fishing, paying for the move themselves is out of the question. The Tribal Council first asked Alaska’s congressional delegation for assistance. While the politicians proved sympathetic to Newtok’s plight, they offered no immediate solutions. A 2009 Government Accountability Office report warned that “no government agency has the authority to relocate communities, no governmental organization exists that can address the strategic planning needs of relocation, and no funding is specifically designated for relocation.” Current disaster prevention and relief programs are structured to provide protection in place (by building a sea wall, for example), not to wholly relocate a community. Newtok, then, poses a new challenge. The State of Alaska proved more responsive but, like many states, finds itself strapped for funding. In 2007, then-governor Sarah Palin formed the Alaska Climate Change Sub-Cabinet, tasked with developing a statewide strategy to understand and respond to the impact of climate change. The Sub-Cabinet’s mandate included identifying the needs of communities imminently threatened by the effects of erosion, flooding, permafrost degradation, and other climate change-related impacts. Newtok was listed as one of six communities most imperiled by climate change. Funding trickled in for studies, but the studies have yet to translate into action. Faced with stultifying responses from the state and federal authorities, the tribal council turned to the broader public. For a village of fewer than 400 people, Newtok has garnered a surprising amount of media attention. NPR aired a piece dubbing the villagers “America’s first climate refugees;” the British newspaper, The Guardian, ran a six-part series on Newtok; a professionally shot fundraising video posted on Vimeo, “Newtok Moves,” entreated viewers to visit a website and donate — $25 for a door, $500 for a house. The Newtok post office. Photo by Jon Meyer. With one week remaining in the mission, I hop on a Zodiac inflatable raft bound for Newtok. For nearly two months, I have gazed north down the Ninglick River where, on clear days, the water tower of Newtok is visible. Moses has described life in Newtok, but now I will see the sinking town for myself. I don a bright orange Coast Guard survival suit, and join a crew of three in the Zodiac. It is a wet, frigid ride with the incoming tide creating a chop against us, but after two hours and multiple groundings on the shifting mudflats, we land in Newtok. The erosion is apparent. We scramble up crumbling blocks of earth that line the banks of the Ninglick. I now understand how, between 1954 and 2003, approximately three-quarters of a mile of tundra fronting the village has eroded. We strike out for the Newtok School, following the wooden boardwalks that stretch like webbing across the town and provide the only safe purchase for walking. The school, as the largest structure in the town, also serves as the current community evacuation center. The town is quiet. Dogs nap on the backs of snowmobiles, as though in a sort of reverse-hibernation, waiting for winter to come. Many of the villagers are out fishing. We approach the school, where word has spread about the arrival of four men in bright orange Coast Guard suits; Stanley Tom, current president of Newtok’s tribal council, greets us around the corner. He offers to serve as our tour guide and, without waiting for an answer, begins to regale us with stories about the town. Tom tells us of his ancestors’ seasonal migrations among several fishing and hunting camps in western Alaska, following the wild game and salmon. Then, in the early 1900’s, the Department of Interior’s Bureau of Education mandated the education of Alaska Native children. The impacts of this decision are felt to this day: it led to a cultural shift for the Yup’ik from seasonal migration to the establishment of permanent communities at school sites selected by the federal government. Newtok was founded as one such site in the early 1950s. My crewmates and I listen intently but after two months of eating MREs, we pine for Mountain Dew, Snickers, and Cheetos. Might the tour include a stop by the local market? Stanley, ever the entrepreneur, responds, “Of course! You can come to my store!” It is one of two in the town. He flips on the generator and we spend the next half hour stuffing our survival suit pockets before returning to the Zodiac. A group of kids come tearing around a corner as we near the craft. They wave excitedly to grab our attention. The tallest one proudly stretches out a dead bird in his hands. I try not to take it as a bad omen. The Mertarvik mission, focused on building a new community, is the first of its kind for the military. I suspect it may also be the last. The logistical challenges are enormous. Supplies must be shipped along an Alaskan coast notorious for shifting channels and bad weather. The 2012 mission was scrubbed after one of the supply ships ran aground off Kodiak Island and spilled fuel into the Alaskan waters. And what about the ultimate impact of the work? The military constructs a number of buildings and lays the foundation for an evacuation center, but who pays for the airstrip, the school, and the plumbing? One afternoon, I join Captain Hailey to observe the Marines at work. He has served as the commanding officer since the mission’s inception. I ask him what he would expect to see if he returned to Mertarvik in ten years’ time. Would Newtok move? Would Moses’ house become the center of a bustling neighborhood? He shakes his head reflectively. “No, I expect you’ll see a slow trickle of villagers from Newtok to Mertarvik…unless some sort of disaster hits.” I wonder whether the disaster has already hit, whether it’s moving just slowly enough that he can’t see it. On the last week of the mission, Moses invites me to join him for a steam bath. 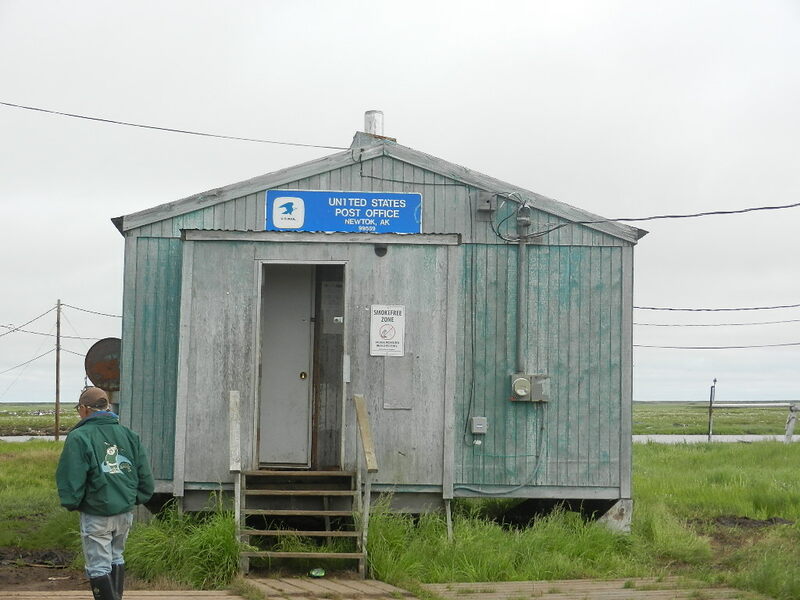 The steam hut serves as a combination sports bar and shower for the Yup’ik; it is a place to talk with buddies after a long day of fishing and the spot to scrub away the smell of salmon. I accept the offer. When I arrive to Moses’ back yard at the appointed time, he and his young grandson already sit crouched in the changing room of the hut, stripping off their clothes. The hut itself is constructed out of plywood and divided into two chambers, a changing room and steam room. The entire structure is no more than twelve feet long by six feet wide, with a low roof that forces me to stoop. Once disrobed, Moses hands me a raggedy cheesecloth. My instinct is to cover myself; Moses wraps his around the head like a bandana. He slides a panel of wood to the side and beckons me to enter. Immediately, I am hot. Blazing hot. Beads of moisture form on my skin. Each breath brings with it a burning sensation down the length of my lungs. I struggle to find the lower, cooler air near the floor but have no hope of matching the yogi-like flexibility of my two companions. Moses displays no apparent concern for my welfare as he ladles water onto the bed of rocks and triggers a fresh wave of searing, moist heat. I want to scream, “Mercy!” and escape, but I resist the urge. At the very least, I need to outlast the grandson. Conversation ceases as we focus on the effect of the steam on our bodies. Another ladle from Moses. I dully note the surreal nature of my surroundings — I am in a plywood hut on the edge of the Bering Sea, sharing a steam bath with two Yup’iks. Moses’ grandson adopts a fetal pose on the floor – he can’t last much longer. Or can he? I no longer trust my senses. I fear I am delirious. Moses grabs a suds-laden cloth from a peg and begins lathering up. I rock back and forth silently in the corner. Moses reaches for the ladle and pours on a fresh round of water. “Helps with the rinse,” he says softly. The grandson breaks and makes a move for the exit. At last! I scurry behind him out of the steam room and into the cool, open antechamber that sits plainly in view of Moses’ house; the entire extended family, visiting from Newtok, gazes out from the kitchen window. Only Moses remains inside the hut, adapting to the changes, adapting to the heat. Update: Members of Moses’ family remain in Newtok. Efforts to relocate the villagers have stalled due to a lack of funding. It is unknown whether Moses remains in Mertarvik. Will Murtha is the Editor in Chief of Sage Magazine and a former Navy medic. Bravo! Best story yet to date about Mertarvik. I am the engineer tasked with beginning the construction of infrastrucre, specifically the road system, which will kick off the summer of 2017. You presented both a fair and accurate description the dilemmas and challeges of moving a community on the edge of the known world. Don’t hesitate to contact me if you want an update or just to trade sweat lodge stories.